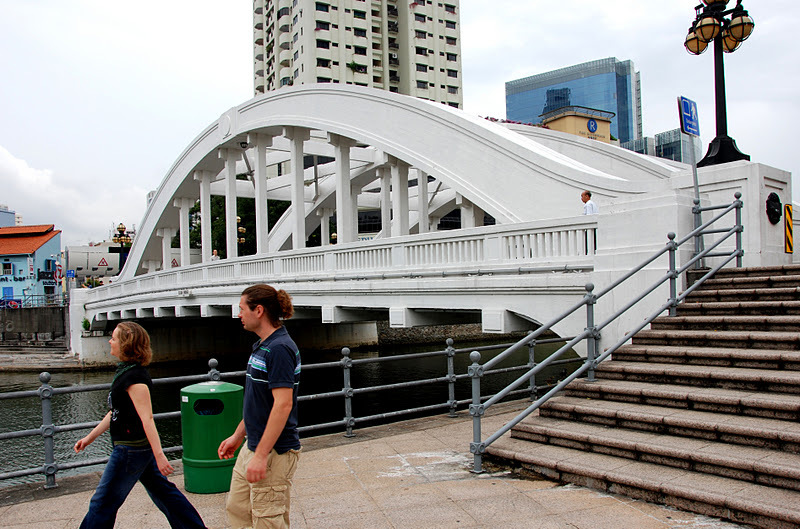 The first bridge to cross the Singapore River was built at this spot in 1819. It linked the Chinese community on the south side of the river to the Indian merchants on the north, and so the roads on each side were called South Bridge Road and North Bridge Road. The street names have remained the same but the bridge has been replaced several times. The current Elgin Bridge is a tied arch bridge that was built in 1929. It is 46 m (151 ft) long and 25 m (82 ft) wide. It carries the name of the Governor of India at the time that the previous bridge was built at this site (in 1862). Like the Anderson and Crawford Bridges, it is supported by three concrete arches with heavily reinforced concrete hangers supporting the floor beams and the deck. Like the Anderson Bridge, there are two traffic lanes between each pair of arches and pedestrian walkways outside of the arches. However, because the Anderson Bridge is near the mouth of the river it is considerably longer than the Elgin Bridge. Simple concrete cross-framing members provide lateral stability between the arches. Handsome cast-iron lamps are supported on pedestals at the ends of the arches (taken from the previous bridge at this site). Below the lamps are bronze plaques showing a lion striding in front of a royal palm. This is what Sang Nila Utama, the founder of Singapore in 1299, said that he saw when he first landed on the island. The bridge was refurbished in 1989 and selected for conservation in 2008. Singapore's Bridges: Elgin Bridge by Mark Yashinsky is licensed under a Creative Commons Attribution-NonCommercial-ShareAlike 3.0 United States License.